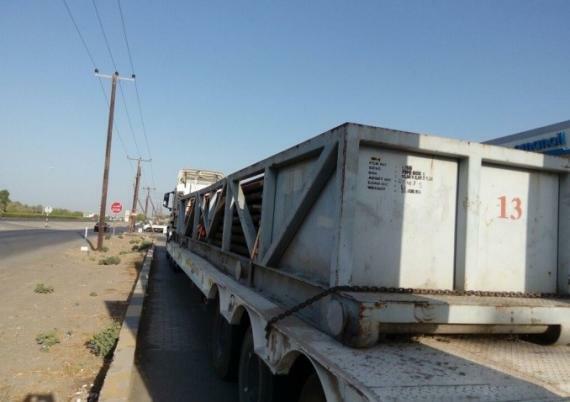 Khimji Ramdas Projects & Logistics Group are members in Oman and have successfully delivered a RIG 106 carrier and mast as well as their accessories to one of the major players in the oil & gas industry. 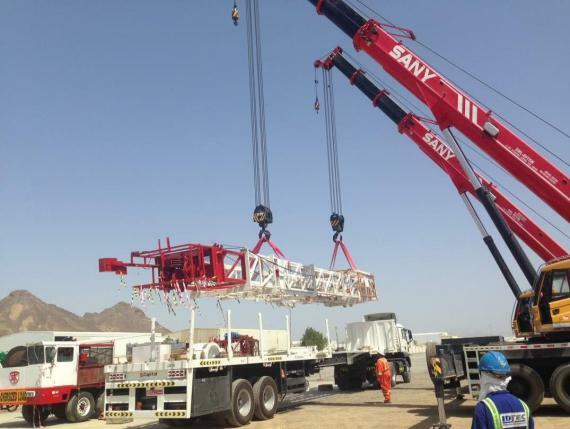 The rig and its parts were brought to Oman from Jakarta in Indonesia on board a multi-purpose heavy lift vessel, self-geared with 4 cranes of 32m/24m outreach. After discharging at Sohar Port in Oman, the cargo was customs cleared and the OOG packages were successfully delivered to Nizwa, around 350kms away from the Port. 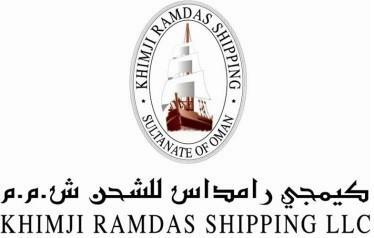 Khimji Ramdas handled the entirety of the Oman leg, right from the discharge of the cargo until final delivery. See the gallery below for photos. The rig carrier (on wheels with dimensions of 1542 x 270 x 310cm and weighing 25tns) and the rig mast (with dimensions of 1875 x 255 x 160cm and weighing 18tns) were the most critical parts, not only in terms of their size, but also due to their sensitivity to the whole package. The heaviest pieces were the 2 pipe boxes weighing 36tns each (dimensions of 1088 x 295 x 125cm). 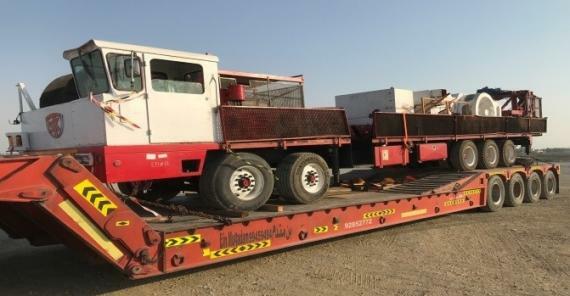 3 x 100tn low-beds (carrying the rig carrier and the 2 pipe boxes), 1 x 18m long flat-bed (carrying the rig mast) and 6 x 12m long (and 3m wide) flat-beds were used to transport the OOG components to Nizwa whilst the in-gauge components were carried in 12m flat beds. A total tally of 13 trailers were used in the whole project with the dispatching from port and the offloading operations at site handled with 100tn cranes. Traversing the distance of 350kms, through the city limits of Sohar, Muscat and Nizwa was the main challenge of the job. However, despite all odds, the whole operation was successfully and safely completed by Khimji Ramdas within a span of just two days from customs clearance. Khimji Ramdas would like to thank all the project stakeholders for providing this opportunity to deliver successfully, yet again. "Khimji Ramdas in Oman - providing synergy to the growth movements in Oman."